Today was my first road race of 2014, the Mid-Winter Classic 10-Miler in Cape Elizabeth, ME. While I was working through the last few miles, I thought about this blog post to avoid thinking about the fact that I was pushing my legs harder than they wanted to be pushed. In many ways, this post is for me, but I think there’s something universal about it, too. It’s a point of reflection as I consider my goals for the remainder of the year. I’m poised to take several new risks in 2014. J and I will grow Destination Fitness in ways that will test our merit as small business owners. We’ll contribute our time and effort to organizations that we believe in; we’ll resurrect some of the skills we picked up in our prior professional lives; and we’ll put our creative output into the world to be sometimes accepted and often rejected. Sometimes you don’t know what you need until you have it. Today is day 38 on the road, I’ve run 169 miles since we left, and my first treadmill run didn’t happen until yesterday. We were in Amarillo, TX, there were severe storms in the area and the only roads nearby were too busy to run. So I pumped out a sweaty, boring five miles on the treadmill in the cramped hotel gym. On the heels of my treadmill run, I thought it would be appropriate to give a shout out to the multi-use trails I grew accustomed to while we were out west. L to R: Scenes from Charlevoix (the drawbridge and marina); M and me at the Athlete’s Meeting in the park; the marathoners at the start line; and S and me approaching the finish line. Building a road trip around a marathon training plan takes a bit of effort. We focused first on our long training runs, booking hotels in places that have good running routes (like urban trails or bike paths) and adjusting driving targets based on our daily training schedule. We also contemplated signing up for a race or two to take advantage of closed roads and on-course support. Last Saturday we were scheduled for a 13-mile drop-back week, so before we left home, we looked for a half-marathon in an interesting place and built the first week of our trip around it. Forget 12 Days of Christmas…Here are 12 Months of Races! 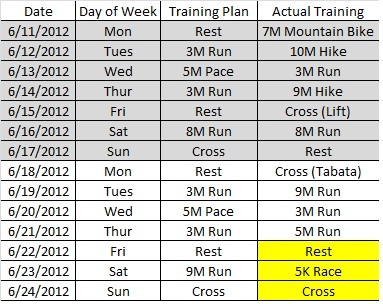 At the start of 2012, we decided to pursue the goal of running at least one road race per month for the entire year. On top of this goal, given our wanderlust, we set out to run races in as many different states as possible. Although we visited 28 states in 2012 (travel summary to follow in our year-end post), it proved much more difficult to find races that aligned with our schedule. First, some areas of the country have more races than others. And second, most races occur on the weekend, further limiting our race options as we traveled around the country. My training locations so far. Week 1–Hiking the Whites. Week 2–Running along the Atlantic. Since we’ve started our travel blog, a pattern has emerged with the timing of our posts: First, we hit the road, blogging three to five times per week about our trips. 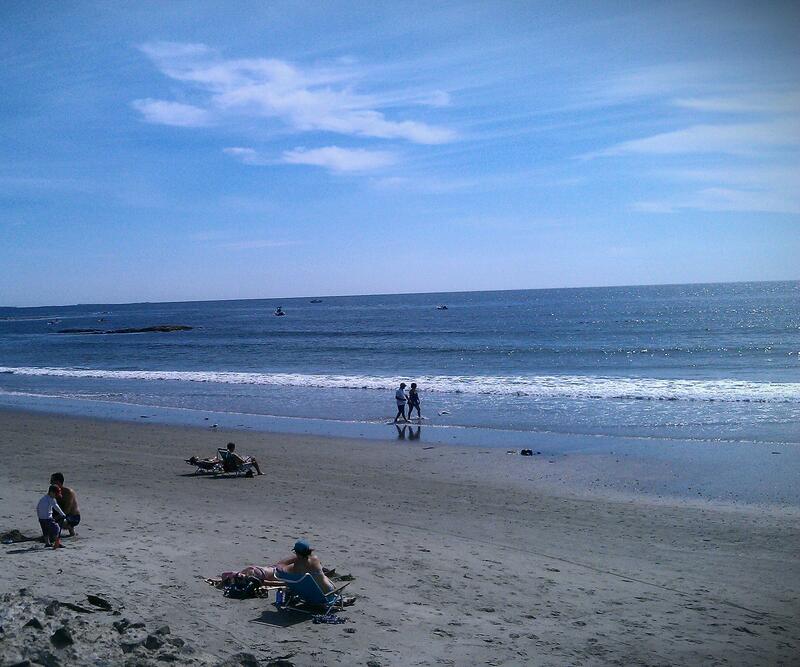 Then, after a few weeks on the road, we return to New England and go quiet for a while. Our silence is usually because our time in New England is filled with chores, errands, and visits with family and friends. It’s not all fun and games, though…someone has to wash my stinky running gear! We followed this same pattern after returning from our last trip to Virginia and Tennessee. Now that we’ve been back in New England for a couple of weeks, it seemed about time to get back on the wagon and get some new posts published. Of course, we leave for Europe next week, which should make for much more interesting posts than picking up dry cleaning, going to the bank and organizing our gear in storage. Stay tuned! For now, I wanted to put a little context around an activity that will color all of our upcoming travel for the next few months. Running! I know…I know…how is this different than any other trip? Well, it’s time for marathon training! It’s almost the end of Week 2 of my 18 week training plan for the Mount Desert Island (MDI) Marathon in Maine. The marathon is Sunday, October 14th, just a couple of days after my birthday, and we’ll be spending the weekend in Bar Harbor for the event. The race is an important milestone for me, since it will be my first marathon since I started running in late 2009. In addition, it takes place in a location that is very important for J and me. We got married on Mount Desert Island in Northeast Harbor in 2011, and (as you may know from some of our prior posts) we returned to the area this year to celebrate our first anniversary. Not only is MDI beautiful, but it carries a huge amount of sentimental value. Anyone who has run a long race or marathon before knows that you don’t just show up to compete. You have to train. And anyone who knows me knows that I like to train hard. It’s rare for a race to go by where I haven’t set and trained for an aggressive time goal (aggressive for me anyway), and the MDI marathon is no different. I’m pushing to finish the race in under 4 hours, with a target pace of 8:30 to 8:45 per mile. I’ve run faster than this in prior races, but never anything longer than a half marathon. Also, in addition to being voted the most scenic marathon in America and runner-up for best overall marathon, the MDI marathon is hilly. One blogger who ran the race reported his GPS watch showing 1,700 feet in elevation gain over the 26.2 miles and just as much in elevation loss. I’m loosely following a Hal Higdon training plan. Higdon is a widely respected runner and author who has been helping runners succeed longer than I’ve been alive. I chose his Novice 2 plan, since it is a little more aggressive than Novice 1. I’ve not run a marathon before, so I stayed away from the intermediate training plans. In a nutshell, the plan increases your training mileage and the length of your longest weekly run week-over-week for 18 weeks leading into the race. There are some lower mileage weeks built into the plan for recovery after the longest of the training runs, and a taper period (period of rest and recovery) for the two to three weeks leading into the race. The plan also designates the pace of each run, with several runs being completed at the desired marathon race pace (“at pace”). The longest training run on the plan is 20 miles, and for me it will take place in late September about three weeks before race day. I moved my long run up this week because we’re running a 5K race on Saturday (part of our goal of running a race per month in 2012). I also substituted some hikes for runs in Week 1 because we were in the White Mountains and the weather was fantastic. I was comfortable with these adjustments in the early weeks of the plan, since the mileage is in my comfort zone of 15 to 25 miles per week. As the plan continues, I need to buckle down. Given the demands of the plan, I don’t want to risk injury due to over-training . Also, since the plan is designed to provide enough rest leading into the longest run of the week and enough recovery after, it’s important that I stick to the prescribed schedule to avoid getting hurt or falling short on the important long training runs. Business Trip or Business Adventure?